With so much focus on the battle in Aleppo, there has been little attention on the Saudi-Egypt rift in the media. And along with this western blind spot is China’s rising influence as a crucial player in Egypt and the Middle East. The rift widened in October when Tehran invited Egypt to join international talks over Syria, and days later Cairo voted for Russia’s UN Security Council resolution that backed the Syrian government. Riyadh retaliated by cutting off 700,000 tons of refined oil products as part of $23 billion deal signed earlier this year. Despite Egypt enjoyed good ties with Saudi Arabia’s King Abdullah in the past, relationship soured after he was replaced by King Salman who is friendlier towards the Muslim Brotherhood—which Egypt considers a terrorist group. As such Sisi began to distance Cairo from the pro-Islamist axis of Saudi Arabia, Turkey and Qatar in the Middle East. The Obama administration’s support for the Brotherhood further fuels Egypt’s sense of betrayal, compounded by GOP threats to cut off aid over Sisi’s anti-democratic legislations, and austere IMF conditions of rolling back energy subsidies that could further destabilize Egypt in midst of waves of terrorist attacks. Unlike Washington, Sisi recognizes that foreign support for the Muslim Brotherhood and increasing terrorism in Sinai threaten the Suez Canal’s stability, which is inextricably tied to Egypt’s own economic development and future. According to military sources, Morsi’s collaboration with Sinai jihadi groups was a source of their disagreement and eventual fallout. Indeed, with $5 billion a year in revenues from the Canal, it is a vital source of hard currency for a country that has suffered a slump in tourism and foreign investment since 2011. Moreover, Sisi sees Assad as a secular bulwark against Islamic extremism in the Levant. If Assad falls, Lebanon and Jordan would be next, and Egypt does not want to end up like Libya with the Brotherhood and other Islamists carving up the country. In response, Cairo is turning towards Russia and Iran, and forming what former Oxford University scholar Sharmine Narwani describes as a new “Security Arc” in midst of Mideast terror. As Egypt pivots towards Syria and Iran, this now further solidifies the emerging Eurasian coalition of Syria, Iran, Russia, China, India, and the Shanghai Cooperation Organization (SCO) where Egypt is an aspirant partner. It also highlights the divide between the Eurasian coalition to counter Salafi terrorism, and the current US/Turkey/Saudi/Qatar coalition to support Salafi jihadists for regime change. Which of course puts Israel in a tough spot. Having chosen to adopt the posture of siding with the Saudis to remove the Assad government at all cost, Jerusalem is increasingly isolated in the Levant as the map shows. As Washington steadily retrenches from the region, and the unlikelihood Trump can dismantle a multilateral nuclear deal enshrined in the UN, what recourses does Israel have to safeguard its security? Enter the dragon in the Great Sea. Given that various great powers have vested interest in the survival of the secular Syrian government, Jerusalem may perhaps follow in Turkey and Egypt’s multi-vector policy of courting Eurasian powers. Already NATO member Turkey will chair the SCO Energy Club in 2017, and have signed a series of deals in November to cooperate on China’s One Belt One Road (OBOR) initiatives. Egypt is also rapidly upgrading ties with China to help stabilize its economy. As the world’s largest trading state, soon to be largest economy, and EU as its top export market, China’s trade and economic well-being depends on the Suez Canal as an important lifeline. To that end China has helped build the Suez Canal Economic Zone, and now has plans for a $45 billion business capital east of Cairo as well as investing $15 billion in electricity, transport and infrastructure projects. Some of these projects will be funded by China’s Asian Infrastructure and Investment Bank (AIIB) where Cairo is a founding member. As China gains more influence with Egypt, Syria, and Iran, it could perhaps play a role in tempering Israel’s security concerns. Given both China and Russia’s massive injection of military and economic investments to stabilize the Middle East, they clearly have no interest in having Iran attack Israel to further destabilize the Levant. Nor would Beijing want Israel to attack Iran, a strategic hub on the OBOR linking the Middle East, Central and South Asia. As such Moscow and Beijing can exert influence over Tehran and help mitigate tensions with Jerusalem. Furthermore, China can improve Israel’s ties with Egypt and Jordan by investing in Jerusalem as an essential part of the global trading ecosystem. 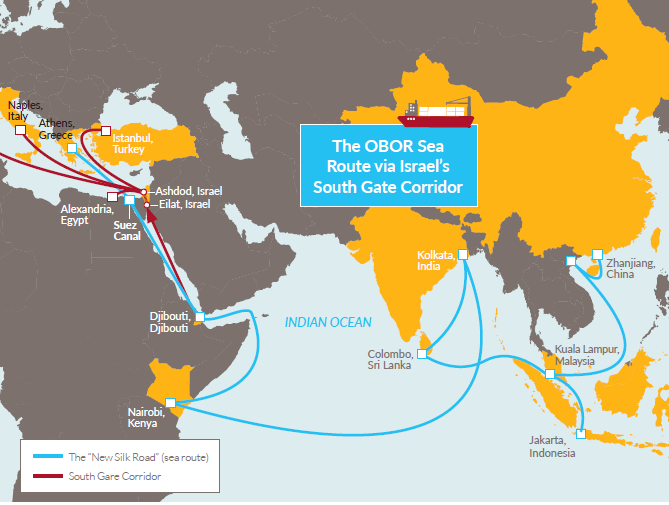 A recent BESA Center report highlights that the proposed Med-Red rail linking Eilat to Ashdod could provide opportunities for improving regional relationships. As a complement to the Suez Canal, and if extended to Jordan’s larger Aqaba Port, this could increase cargo traffic between the Red Sea and the Mediterranean and further link Israel’s economy with Jordan and Arab Gulf states. An auxiliary cross-Israel natural gas pipeline between Eilat and Ashdod can also export gas from Israel’s Mediterranean fields to Asian markets such as China and India via the Red Sea. With Egypt and Israel as important Mediterranean partners for NATO and OSCE, and as key components of the OBOR’s southern trade corridor, increased economic cooperation with China can eventually be complemented by security cooperation and counter-terrorism to help maintain regional stability. The 57-member OSCE, which includes both Britain and EU post-Brexit, as well as the U.S., Russia and Eurasian countries, is already engaging China to promote connectivity on OBOR projects and likely counter-terrorism, since that is the main priority of the incoming Chairman of the OSCE in 2017. Conclusion: Joint China-Transatlantic Eurasian pivot? Already Trump advisor and former CIA director James Woolsey indicated he “expected a warmer response from Trump” on the AIIB and China’s OBOR project. As such a Trump presidency, and China-US/Europe cooperation via OSCE on the OBOR, may actually provide an opportunity for a joint pivot to Eurasia and a silver lining for renewed transatlantic coordination. Fellow at the Center for Transatlantic Relations at SAIS-Johns Hopkins University where she specializes in China-Middle East/Mediterranean relations. She is a former director for China policy at the US Department of Defense and author of The New Silk Road: China’s Energy Strategy in the Greater Middle East (The Washington Institute for Near East Policy).